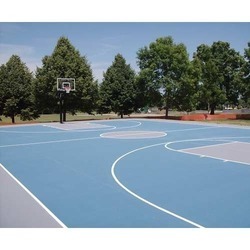 We are ranked amongst the foremost firms, engaged in offering a qualitative Basketball Court Construction, having technically advanced features and sophisticated look. Made by using high grade raw material and latest technology in compliance with international standards. Our esteemed clients. 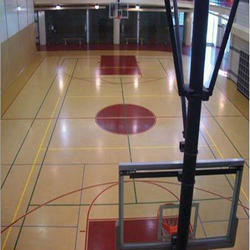 We offer Basketball Court surfaces with best resilient & shock. In basket ball, court basket ball rings are dimensionally accurate and are made in compliance with defined basket ball specifications. We offer basket ball rings that are made from solid steel rod with three springs in a box for excellent performance. We are a reliable Synthetic Basketball Court Supplier based in India. 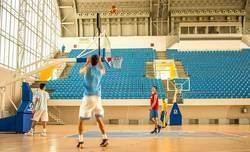 We offer Basketball Court as per the requirement of the sports sector. 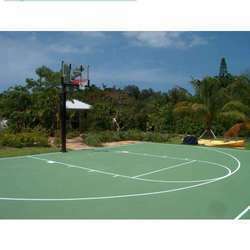 Basketball Court we offer is in demand owing to its durability and fine finish. Avail from us exclusively designed Basketball Court at market leading prices. Available in different non glare stable colors. 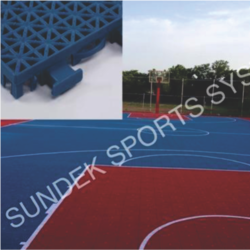 Sundek Sports Systems brings forth for our clients a international standard Synthetic Basketball Floorings. Excellent quality material and advanced technology is employed in the laying process so that our Synthetic Basketball Floorings is in tandem with international quality standards. After completion of the civil construction, we undertake to lay out the Sundek Air-Cush Wooden Flooring System wherein we use kiln dried fsc certified imported oak, teak, maple or beech wood surface board and the base frame of imported fir, spruce or pine wood. The bona anti-skid polish coatings used is din certified. We also undertake civil construction and lighting requirements. All other accessories related to the arena are also available with us. 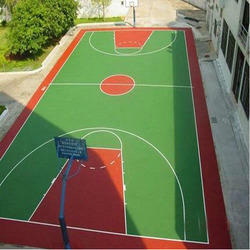 We are offering Standard Basketball Court to our clients. The system ensures that there is no impact on the knees, feet, shins and ankles. Sundek Sports Systems has managed to establish a name for itself in the market for the wide range of products we offer to the customers including Indoor Basketball Court, which are high on demand in the market and we offer a high performance to the customers in the market. 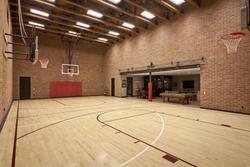 Indoor Basketball Court are very sturdy and have a fine finishing with polished look. Preparation of strong and reliable base is a must for the construction of a synthetic hard court. The polywin synthetic material can be applied on asphalt or concrete base. The court can be prepared in different cushion thicknesses depending on level of players and budget. We also provide chain link fencing, lighting and storm water system in the court. 8 layer system for surfacing, new or old, tennis courts & sport-grounds of similar use. Polywin Pro International differs from conventional coating, including a unique blend of especially sized rubber aggregates, which imparts an outstanding playing quality. This system increases play-time by reducing players’ fatigue while providing an extremely reliable ball spin. Rebound Pro International is considered by professional players as a top quality surface. 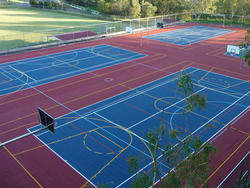 5 layer system for surfacing, new or old, tennis courts & sport-grounds of similar use. This system is characterized by the interposition of 2 additional coats of liquid rubber cushion which impart a good flexibility & improve the durability of the coating. 3 layer system for surfacing, new or old, tennis courts & sport-grounds of similar use. This system is also adopted for restoring wearing or weathered courts to a quality playing surface. The installation of Rebound Synpave, whilst not providing cushioning, will provide sure footing & confidence with reduction in injury. We at Sundek Sports Systems supply PP Tiles for Basketball Court, which is widely applied in different sports and leisure places. PP Tiles for Basketball Court are made of high quality raw material resulting in superior performance. PP Tiles for Basketball Court is replacing traditional Synthetic Acrylic Courts, Silicon PU Courts, EPDM Courts and all other forms of outdoor courts. The life of PP Tiles for Basketball Court is about 10 – 15 years. Made of high polymer PP material. It's finished product before leaving the factory. No bubbling happens. 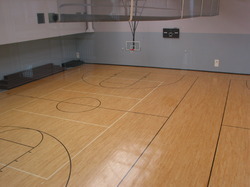 One full court is combined with small single finished tile. Foundation crack can’t make the PP Tiles for Basketball Court crack. No weather influence. Construction can be done immediately after rain. One day one court. Finished products on site. Immediate assembling. Professional production line ensures the stability. Imported PP master batch. Stable formula. Machine made. Precise control by professional facility. No color difference. 3mm wear resistance layer, adopting imported aluminum oxide above 45g. Wearing strength reaches AC3 and above. Hollow supporting points design makes certain hanging height. Rain goes away from the tile bottom, no ponding. Adopt high quality imported food grade PP as raw material. Integrated molding, recyclable, no pollution.